In the first study we looked at from ‘Features of adherence to medical regimes’ Bulpitt and Fletcher (1988) – Reasons for non-adherence: cognitive rational non-adherence, we looked at rational reasons for patients not adhering to medical regimes. Simons et al suggest that the reasons for not adhering are often irrational and therefore may be open to interventions to improve. Ley (1981) Proposed The Cognitive Hypothesis Model of patient compliance, which suggests that patients have to understand and remember the medical regimes and thirdly they have to be satisfied with the regime, that is there is a lack of side effects and it is not to difficult for the person. If all three of these conditions are met, the patient is highly likely to adhere to the medical regime. Contingency contracts which involve rewards and punishments. Direct reinforcements – for example being given target based rewards. Punishment – For example in New York laws were changed so that people had to take the treatment (tuberculosis) and come to the clinic and be seen to take it or face compulsory admission to hospital. The Funhaler as used in the Watt et al (2003) study. To see if using Funhaler can improve children’s adherence to taking medication for asthma. Self reports were used to measure adherence. Each child was given the Breath-a-tech for one week. The parents were given a questionnaire to complete. In the second week the children used the funhaler and the parents were given another questionnaire with matched questions. 38% more parents medicated their children the previous day with the Funhaler in comparison to the existing treatment. The spinner and whistle works well as a reinforcer to children with asthma, and helps to improve adherence. 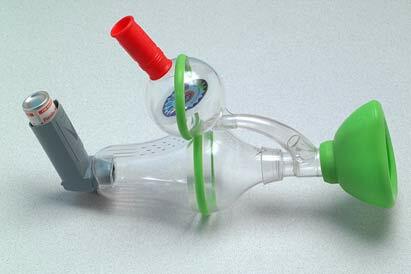 The use of the funhaler does improve adherence to asthma medication. + Useful the study is useful for increasing health behaviours in individuals, as increasing or simply implementing reinforcers can increase adherence to medication. – Ethnocentrism – the sample consisted asthmatic children only, therefore we can argue that it is difficult to generalise the results to wider populations. – Reductionism – the experiment has not considered the wider causes for the adoption of health behaviours. + Construct validity – this study shows support for behaviourist operant conditioning. Watt et al., (2003) ‘Funhaler spacer – improving adherence without compromising delivery’, Archive of Disease in Childhood 88 (7), 579–82). 'Features of adherence to medical regimes' section of 'Healthy Living', ReviseOCR A2 Health & Clinical Psychology exam. Revision 'Improving Adherence' evaluation.